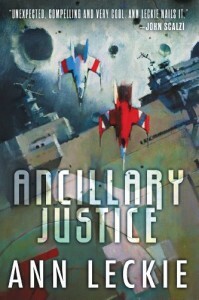 Ancillary Justice is science fiction crammed full to the brim with wild ideas. The main character, Breq, is an “ancillary soldier” cut off from her ship for almost twenty years, but she isn’t exactly human, at least not by the standards of her society, the Radch. The Radch, it seems, were aggressive about expansion over thousands of years. As part of that expansion they captured entire civilizations and turned the leftover bodies into these ancillaries – soldiers that shared a mind with their ships, that were effectively as much a part of their ships as any piece of the hull. Corpse soldiers, to quote a slang term. Breq, who comes from a ship called the Justice of Toren, has spent the past twenty years tirelessly working towards revenge against Anaander Mianaai, Lord of the Radch, who shares one similarity with Breq and other ancillaries: she has thousands of bodies under her control. This, naturally, complicates Breq’s plan for revenge. In the current day scenes, Breq searches for an artifact that will help her carry out her plans while also caring for a petulant drug-addicted former solider who once served on her ship. These alternate with flashbacks to Breq’s time spent as an ancillary soldier on the last planet annexed by the Radch. Leckie does a great job of slowly revealing more and more about Breq’s past and the nature of the tragedy that befell her ship. She also takes fairly simple building blocks and turns them into fascinating philosophical mind-benders. What, after all, does it mean for Breq’s I to mean the ship Justice of Toren but also all the hundreds of ancillary soldiers in her hold? The narrative is simultaneously first-person and omniscient, jumping from place to place as the ship’s many perspectives build to a greater whole. Leckie also sets up the Radch society as one that does not distinguish between the genders when speaking. In practice, this means that everyone in the book is “she” regardless of gender. Further complicating matters for Breq is the fact that she has a hard time distinguishing gender traits when in other societies, and tends to use incorrectly gendered pronouns. At first I found this a bit confusing, but once I got used to it, I found myself not really worrying about the gender of characters. Leckie drops hints here and there as to the actual gender of certain characters, but in practice it doesn’t actually matter. The scope of Ancillary Justice feels simultaneously personal and global; Breq’s actions are deeply rooted in events from her past, but the result of her fight against the Lord of the Radch could have far-reaching repercussions. The world-building is pitch-perfect, and never feels heavy-handed or overwhelming. As soon as I finished this book, I checked to see if Leckie has any plans to continue writing in this world, and she does – apparently this is the first book in a loose trilogy. That said, it feels like Breq’s quest is contained; the end does set up possible future stories, but I couldn’t begin to guess where else Leckie might take the world of the Radch. However, I find that exciting. I think my favorite part of this book was the way that Leckie took so many truly alien elements and made them feel natural and believable. The characters are human, but a type of human thousands of years removed from our society, and changed in many strange ways. We don’t ever meet any non-human characters, but they lurk just at the edge of the story, menacing and dangerous. I can’t wait for the next book in this series, and I’ll definitely be checking out Leckie’s short stories as soon as possible.